There was a time in the not too distant past when the term Master Penman (men and women) was used to describe individuals who attained mastery of the writing arts. The purpose of this site is to keep their memory of their work alive. 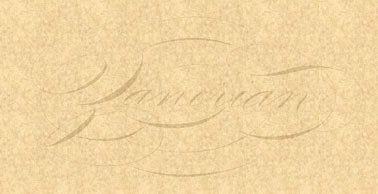 The art of penmanship and engrossing in the United States reached its zenith at the Zanerian College in Columbus Ohio. The main focus of this web site is the promotion of Engrosser's script. However, Ornamental penmanship and engrossing will also be represented. We would like to acknowledge Michael Sull's generosity in allowing the use of materials from his monumental two-volume work 'Spencerian Script and Ornamental Penmanship'. Description: This is the first interactive iBook for Copperplate-style Calligraphy made specifically for the Apple iPad. This is a free book available for immediate download. The multimedia instructional materials contained within will help both the novice and advanced students. 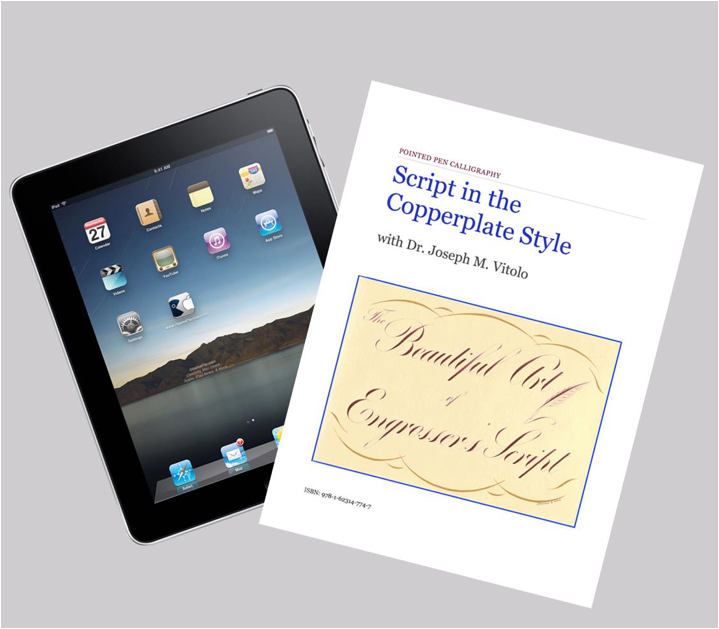 The fundamentals of Copperplate calligraphy are the focus of this Book with particular emphasis on letterforms. In addition, advanced concepts including Needle Stitch Script, and Gilded Script are examined. This book is more than 80 pages are packed with instructional text, images and more than 35 videos presented in an interactive format that will allow the student of the art form to accelerate their learning. To download the iBook click HERE or on the image below. Have you ever wondered how those highly sought after vintage pen points were manufactured? Click Here to see how Gillott manufactured their legendary 303 more than a century ago. A gallery dedicated to female penmen. Specimens from historical and modern day penmen including WA Baird, FB Courtney, WE Dennis, EA Lupfer, Charlton Howe, Louis Madarasz, CW Norder, JD Todd and CP Zaner. Selected works were scanned at high resolution. This gallery contains several styles of Oblique Penholders from my personal collection. In addition, several images of penholders (not in my collection) belonging to historical Master Penmen are included to demonstrate the variety of holder shapes that were used. A wonderful collection of pen holders previously owned and used by several past master penmen. Thanks to penman and historian Don Tate for sharing this truly marvelous collection thought to be the famous RR Reed Collection. Thanks to IAMPETH Webmaster James Ivey for constructing and posting this page. This gallery contains several historical examples of gadgets made specifically to help an individual learn penmanship. Follow this link to view selected pages from an early Zanerian Catalog. The pages are very informative and provide prices of several popular nibs including the Zanerian FineWriter and the Gillott Principality. At the time this catalog was published, a gross of Gillott Principalities cost $2.00. Follow the above link to view important penmanship publications of the past and present. In the coming months, this website will be undergoing some changes as a result of a partnership between Dr. Joseph Vitolo and David Grimes. If you have any concerns or input, please shoot us an email.